The first recipe I made for my blog was a curry ramen recipe, inspired by the dish I first tried at Shoryu Ramen in Regent Street. Find the recipe here. Since then, I have returned to Shoryu and tried their curry ramen dish again and decided to make a new curry ramen with a more intense flavour and with the addition of turmeric for its richness of flavour and stunning vibrancy of colour. Turmeric is widely considered to be beneficial to health, with antibacterial properties, as well as possibly helping against different diseases, such as cancer and Alzheimer’s. Combined with a hearty chicken stock base, considered the cure-all for those pesky colds that seem to go round at this time of year (I got ‘fresher’s flu’ every year I was at uni! 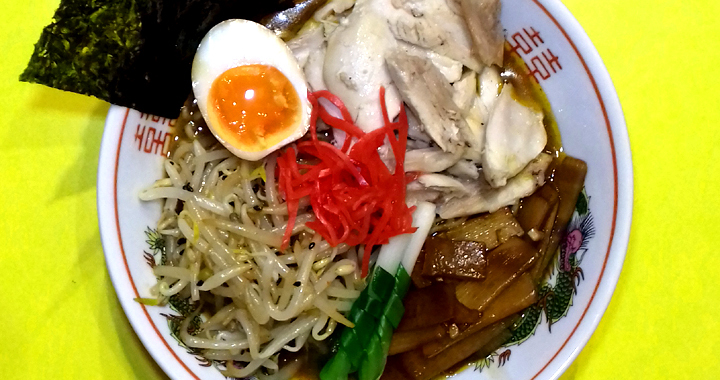 ), this ramen is the perfect health boost for these cooler Autumn days. I have recently discovered Biona organic spelt noodles, made from spelt flour. Low in fat and lighter than traditional ramen noodles, they taste great too, with a great texture. I also added a new ingredient to the ramen egg marinade. We holidayed in Wales at the beginning of the month and I discovered the Pembrokeshire Beach Food Company, buying their mermaid confetti, a mix of sea salt and laver seaweed. They have stockists throughout the UK, so check their website for your nearest. I added just half a teaspoon to the marinade for extra salty, umami flavour. I decided to keep the chicken meat plain in this recipe, as you can’t beat the flavour of chicken cooked on the bone, but you could marinade the legs in teriyaki sauce for a few hours for a subtle flavour if you wished. Preheat the oven to 180°c. Put the chicken legs on a baking tray, sprinkle with salt and pepper and add a small knob of butter to each leg. Add the onion, unpeeled, to the tray. Cook in the oven for 40 minutes. Leave to cool. Once cooled, remove the skin and strip the meat from the chicken legs. Put the bones and skin into a wok or large saucepan with a lid and cover with 1 litre of cold water. Peel the onion and quarter and peel the carrot and add these to the wok as well with the peppercorns and a little salt. Bring to the boil. Turn the heat to low, put a lid on and simmer for 1 ½ to 2 hours, stirring occasionally. Using a slotted spoon or sieve, remove the bones, vegetables and peppercorns from the stock. In a wok, heat the oil and stir fry the shallot and garlic until lightly browned, about five minutes. Turn the heat to medium and add the turmeric, paprika and curry powder. Stir fry for a minute to release the flavours. Add the stock to the pan, with the sugar, chilli strands and Shaoxing rice wine. When boiling, reduce the heat to low and add the curry roux blocks. Stir to melt. They will cause the broth to thicken up slightly. If the broth seems too thick, add a little more water. Keep the broth warm while you prepare everything else. Prepare the beansprout salad and menma. Blanch the spring onions in boiling water for a minute, then put into cold water for a minute and drain. You can leave them like this if you want, but I folded them in half and wrapped the green part of the spring onion around the white to make a little wrapped up spring onion. Give them a little squeeze so that they don’t unravel. Prepare the ramen noodles as per pack instructions. The Biona spelt noodles take 5 minutes from boiling to retain just a little bite. When cooked, drain in a colander, moving the colander from side to side to remove any excess water trapped in the noodles. Serve the noodles in your serving bowls and ladle over the curry broth. Arrange the toppings over the noodles and serve. Posted in Ramen Dishes, Recipes and tagged Chicken, Curry, Ramen, Turmeric.